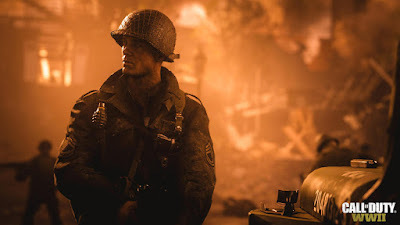 Winter Siege features a new winter version of the Carentan Multiplayer map , Which contain Snow effect ,winter themed version of fan favorite ,previously only available as redesigned Carentan to Season Passed owners .Headquarters is getting a seasonal revamp too ,with a visiting quartermaster along with new Supply Drops full of fresh cold weather gear . The Event also brings a new look for Headquarters . It will be winterized ,with the beach encampment taking on a snowy appearance for the span of the event .There will be a visiting Quartermaster ,too .Captain Butcher visits Headquarters bearing Winter Siege Division uniforms ,cosmetic items and weapon variants. Players can also earn a variant of each new weapon for free via special orders from Major Howard .Other variants of these weapons are available through collection Bounties ,or in Winter Siege Supply Drops .Winter Siege Supply Drops can be earned for free simply by playing Call of Duty World War 2 during the event .players will also collect a free Winter siege supply drops for logging in and you can purchase Winter Siege Supply Drops using Call of Duty Points .